Healthcare Staffing company, Medical Solutions introduces the first ever mobile website in the healthcare staffing industry as well as a new brand identity that includes a redesigned website and corporate identity. Medical Solutions, Inc., one of the nations leading travel nursing companies, is proud to announce the launch of the industry’s first true mobile website as well as a newly redesigned website, all of which is part of the unveiling of a new brand identity. Beginning in January of this year the company partnered with Staffing Robot, a healthcare staffing web design and marketing firm to help develop the new components of the brand identity. The launch of the new mobile site, redesigned website and brand identity are a direct result of the continued growth the company has experienced and its goal to broaden its reach and appeal to the modern healthcare professional. 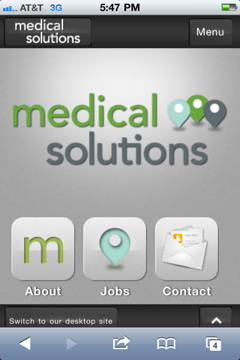 The new mobile website enables Nurses and other healthcare professionals to easily access the most popular services of medicalsolutions.com through their internet-enabled devices and performs like applications (apps) found on most smartphones, with one difference being the site is accessed through a web browser. The mobile site will provide convenient access to important online tools such as a newly designed job search, a simple, easy application format, educational and testimonial videos, news and announcements, and important information about Medical Solutions. "As a web marketing company for the healthcare staffing industry, Staffing Robot constantly seeks out innovative clients that are leaders in the space,” said Jason Lander, Founder, and Chief Promoter. “Medical Solutions was the perfect company to partner with for developing the first mobile website in the medical staffing industry. They recognized the value of providing their services in a mobile environment and stepped up to the challenge of helping to advance the industry." In addition to the new mobile website, Medical Solutions also redesigned its current website which takes advantage of today's standards in web design and flow, all of which makes it easier for visitors to navigate around the site. The company has always focused on its travelers and clients and many of the new highlights of the site revolve around its core customers. One of the key new features of the website reinforces Medical Solutions commitment to putting the customer first with a main page that functions like a photo gallery full of user submitted photos which link to stories of their favorite experiences and travels. A second innovation to the site is the newly designed job search function. Users can now look for jobs by simply choosing between three search filters; job title, job specialty and state. The job search function has been made easier and will help candidates search and apply for jobs while on the move. The final component to the new brand identity is the creation of a logo which includes a new typeface and visual elements that represent diversity and individuality using a palette of five colors that can be applied across a range of media. The new brand identity is designed to better reflect Medical Solutions customer first mentality, built on a continuing history of innovative ideas and services that meet the needs of traveling healthcare professionals as well as hospitals and other healthcare facilities. Staffing Robot will change the way you think about marketing your healthcare staffing company on the web. From creative website and mobile website design, to staffing products that will improve your business, to strategic marketing campaigns that work – we help you promote your brand and achieve your goals. We know the subtleties and complexities of the healthcare staffing industry and apply our knowledge to your business objectives to help you be successful. For more information about Staffing Robot, visit staffingrobot.com or call 971.533.8839. Medical Solutions, Inc. was one of the first travel nurse and allied healthcare staffing companies to be certified by the Joint Commission and has been continuously certified since 2004. Its focus is on meeting the urgent and short-term staffing needs of its clients with highly skilled allied health professionals, nurses and technologists. A nationwide network of travelers allows Medical Solutions to help its client hospitals continue to provide excellent patient care amidst a nursing and allied health shortage. Medical Solutions has contracts with nearly 900 client hospitals nationwide and is one of the fastest growing companies in the travel nursing and allied health industry. Visit MedicalSolutions.com to learn more.